Remember the most beloved President of our time When John F. Kennedy was sworn in as the 35th President of the United States in 1961, America fell in love with his youthful charm, good looks, andquick wit. His brilliant political career was cut short by an assassin's bullet on Friday, November 22, 1963. Now you have the exclusive opportunity to add this dazzling tribute to America's 35th President to your collection with this exquisite, luxuriously silver-plated coin. 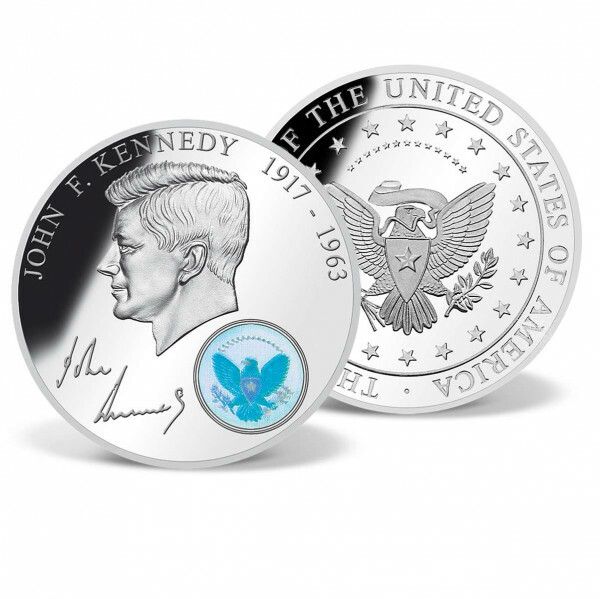 Meticulously designed and available exclusively from AMERICAN MINT®, your commemorative coin features a highlydetailed engraving of JFK and is accented with a precisely inlaid hologram honoring the Presidency. Minted to the highest quality "Proof standard, this coin is strictly limited to only 9,999 complete collections worldwide - a true collector's item.